EZCHECK® and EZTEST® software products constitute a verification framework for safety related applications, enabling function developers to leverage advantages of model-based design with Simulink® and Stateflow® for static (checking) and dynamic (testing) verification of models and integrated C code. EZCHECK® and EZTEST® software products were designed for easy verification at model level. No product training is needed to become productive. EZTEST® software enables test-driven design of dynamic systems developed with MATLAB®, Simulink®, Stateflow®, TargetLink® and integrated C-code. It supports MIL, SIL and PIL verification with manually developed or automatically generated external C-code. EZCHECK® and EZTEST® software products simplify the development workflow by providing engineers with mental aids, improved feedback and better control of a system's complexity. EZCHECK® and EZTEST® software products help engineers conquer the system complexity, empowering them to build the right software in the right way, faster. EZCHECK® and EZTEST® software products support continuous verification of safety related applications at unit and integration level. The documentation of each product includes a safety manual assessed by TÜV SÜD. The Qualification Kits with validation tests are included. The shipped documentation provides information needed by safety managers and function developers to comply with the IEC 61508 safety standard as well as derived standards like ISO 26262 . EZTEST® software is a highly interactive testing and analysis framework for model-based design and verification. It is well integrated with MATLAB®, Simulink® and Stateflow®, enabling users to leverage advantages for simulation and verification on the unit level with unprecedented simplicity and speed. EZTEST® supports the creation, management, execution, assessment and documentation of simulation-based tests in a systematic manner. You can automatically create test harnesses to test models, subsystems or libraries. EZTEST® also enables a test harness free verification of models without creating separate test models. EZTEST® lets you create and manage complex test cases consisting of time-, input-, and reference vectors, parameters, requirement links and comments. You can link requirements to a test case by using a unique requirements ID in the comment field. The baseline assessments are done automatically by comparing outputs and reference values. The assessment results are represented graphically and stored in the same interface for better usability. You can apply pass and fail criteria that include absolute and relative tolerances and automatically check the boundary values of the interfaces. More sophisticated assessment conditions can be modelled in MATLAB®, Simulink® or Stateflow® and verified separately by using the same systematic unit-based workflow in EZTEST®. EZTEST® enables requirements-based (functional), baseline, equivalence, and back-to-back testing, including software-in-the-loop (SIL) and processor-in-the-loop (PIL). You can generate verification reports, archive and review test results, rerun failed tests, and analyze the data- and control-flows in the models with an integrated step-by-step debugger. The test cases can be executed one-by-one or in a batch by using a simple graphical user interface (GUI) or customizable command line application program interface (API). EZTEST® stores test cases and their results in Excel and produces verification reports in XML and HTML formats. 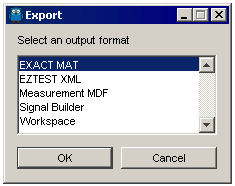 EZTEST® supports the export and import of test data for MDF, MAT, Signal Builder and XML which simplifies the exchange, analysis and review of work products in big projects. EZTEST provides a graphical user interface (GUI) to interact with the test object and the test case specification. The GUI can be accessed by double-clicking on the EZTEST blocks inside the test harness model. The toolbar contains the controls for the test configuration, the test specification and the work-product management. From the toolbar you can access product help where all the features are explained in detail. In the EZTEST specification you can define which inputs, outputs and parameters will be used during simulation. The Interface specification for signals and parameters includes the following characteristics: Name, Type, Data Type, Dimension, Min, Max, Unit and Description. In the Interface sheet you can define all the interface characteristics including port order. The CleanUp-Function propagates the modifications to selected test-cases and sets the order, colors and other formal data properties for all selected test-cases. EZTEST automatically creates the Simulink.Parameter objects with the predefined properties. You can redefine the parameter values for each test-case. The outputs are permanently stored. The outputs are compared to references. The comparison results are visualized. All test results are summarized in a textual form. The green color indicates a passed assessment.The light-green color means that the test case passed within tolerances. The red color is used when the output value is other than expected, i.e. the test case has failed. Two types of tolerance ranges are supported: the absolute and the relative tolerances. Both tolerance types can be combined for more flexibility. The tolerance ranges can be used asymmetrically. To support the impact analysis and assessments all requirements shall be traceable referencing to each source of the requirement, each realization in the design, and each specification of its verification. Where are the requirements implemented? Where are the requirements verified? The red color means that the Requirement-ID was found in the model but it is missing in the verification specification, so there is no evidence of requirements-based verification. The yellow color means that the Requirement-ID was found in the verification specification but it is missing in the model, so the traceability has yet to be achieved in the model. The green color is used when the Requirement-ID was found in both the model and the verification specification, so we can assume that the requirements-based test was conducted. The formal inspection of the test-case shall be triggered. The Matrix helps linking requirements to the corresponding design elements, code and test cases. Specifying such requirements references takes little effort during development but is the most impotent characteristic of the excellent software. For testing, the specification of each test case shall include the input data, their time sequence and their values. To model simple sequences of test steps like f.e. signal vectors, parameter settings or signal ramping, the direct test-case definition can be used. It is a very fast way of test signal generation which is easy to document and easy to review. 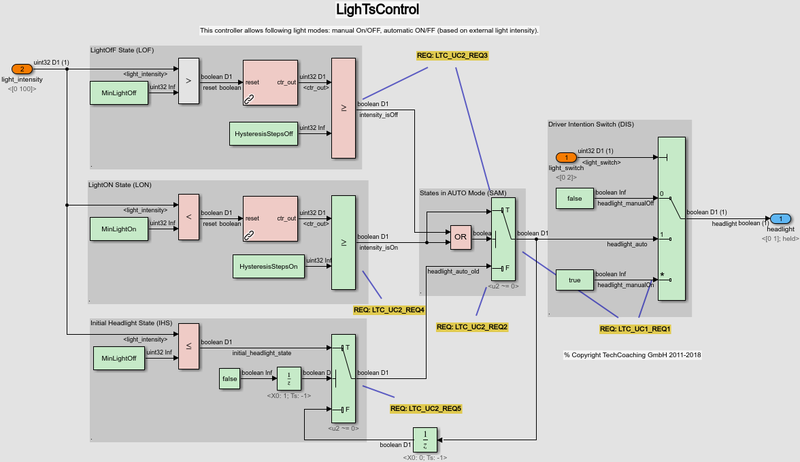 The more complicated test sequences can be generated in Simulink. You can reconfigure the EZTEST interface specification from “Type-I” (for Input) to “Type-Ic” (for Input for Close-Loop Simulation). Such interface specification adds an extra input to the EZTEST_Source-block to feedthrough and document any signal from the Simulink model. Now you can use different Simulink source blocks for importing measurement data and for defining signals as a function of time. Different modelling methods can be combined allowing generation of test sequences with arbitrary complexity. Such test sequences will be saved in a test-case specification for documentation, analysis and debugging. The imported signals are grayed out to demonstrate that they are provided from an external source. You can now reconfigure the EZTEST interface specification “Type-Ic” (for Input for Close-Loop Simulation) to “Type-Io” (for Input for Open-Loop Simulation) to deterministically reuse or manually modify the recorded data. The inport of EZTEST_Source-block will not be deleted in order to preserve the signal line connection. However you can switch to the regular “Type-I” interface to delete the inport if needed. The EZTEST software can be used to create and run test cases and monitor the behaviour of the test objects with base line assessments, i.e. direct comparison of real and expected values. The EZTEST software documents the input data, their time sequence, and the expected behaviour which includes output data, acceptable ranges of output values, time behaviour and tolerance behaviour. The base line assessments can be combined with more complex assessments modelled in MATLAB, Simulink and Stateflow, which is more effective than in other external tools or programming languages. The assessment models can combine conditional comparisons of outputs, monitoring of interface ranges, analysis of state sequence order and restrictions on time behaviour. Such test assessments are particularly effective at reducing the size of test suites for very complex applications, making testing more targeted and efficient. Please open the web view of the model to inspect an example test assessment implementation. They can be verified in the same verification cycle and with the same verification tools as the test objects. Please note that the regular base-line assessments are still a better choice for simple applications at the unit level as they are much faster and easier in development and maintenance. EZTEST streamlines requirements-based verification with its documentation capability, which completes the model-based tool chain. For plotting the signals in the verification report please use the EZPLOT function in the test case Description field. You may plot vector signals by using the MATLAB notation, i.e. “vector_signal” will plot the second column. The related time vector, reference and tolerance values for output signal will be plotted automatically, no need to pass them as arguments to the EZPLOT function. You may use Parameters as supportive horizontal lines. You may show the comments on the plot by putting ‘>’ prior to the comment in the Description field. Vertical orange lines along with comments will appear above the plot. You may zoom some area on the plot and come back to the original view. You can click on the signal legend to highlight particular signal in the plot and in the table below. You can hide the signal by switching them off in the legend. You may generate multiple plots by using the function multiple times. The feature is helpful when dealing with signals of very different ranges, i.e. [0 1] versa [-100 9999]. You can analyze particular areas of the plot by using the value pointer. You can control it in the time area of the EZPLOT or in the numbering area of the data table. The value pointer is synchronized for all data. The signal values are visible in the legend. The changing values are marked in red. You can filter out some signals in the table which you do not need for the analysis of the particular test case by using a !EZPLOT function. The data is still present in the report which is indicated by the red tri-angle near the time vector. You can activate the data-display if needed. Here is the automatically generated EZTEST Report demonstrating the EZPLOT function. EZTEST provides a one-click interface to utilize EZCHECK software for static model analysis. EZTEST triggers the model checker and then renames and relocates the automatically generated EZCHECK Report based on project-specific settings. EZCHECK is a qualifiable tool for static model analysis of Simulink® and Stateflow® models and libraries. EZCHECK provides all you need to check your models, including modelling quidelines, design fixes, verification reports and support. Open EZCHECK Report to navigate in the model web view and inspect the checks. EZCHECK software enforces just enough process to help you deliver safety compliant applications, providing a safe subset of a modeling language, and detecting run-time and logic errors at any model development stage. EZCHECK has been certified as a tool for static model verification within a qualified development environment under ISO 26262 safety standard. It supports any MATLAB release since R2012b. No product training is needed to become productive. EZTEST provides a one-click interface to utilize Simulink Coverage software which collects structural test coverage on model and code level for all executed test cases. 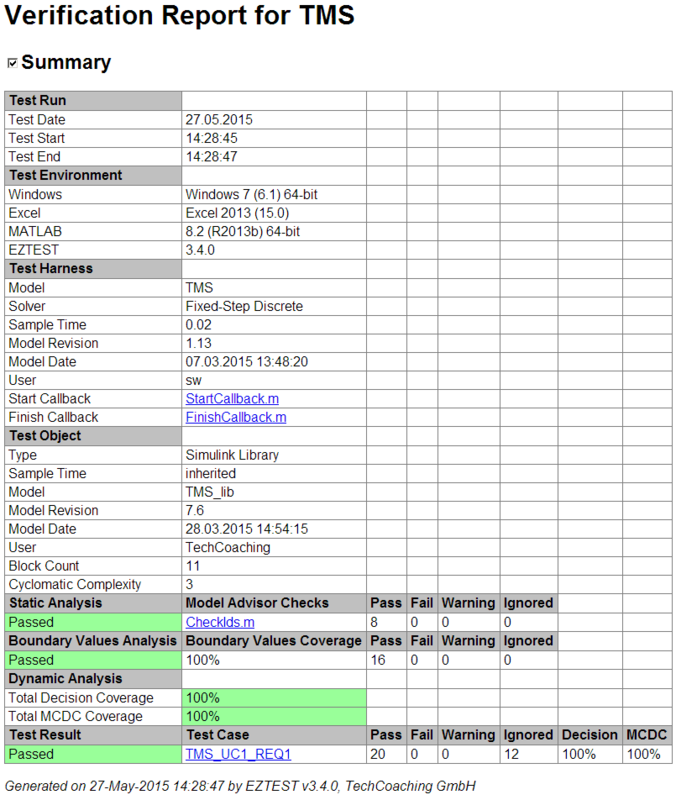 Both decision coverage (branch coverage) and modified condition decision coverage (MCDC) are supported. EZTEST provides intrinsic exclusion handling (see grayed out block in the picture below). EZTEST merges all work products to a self-contained coverage report, renames and relocates it based on project-specific settings. Open model coverage report and review missing coverage information for red blocks in the model screenshot below. Open code coverage report to see how the findings on the model level correlate to those in the generated C code. EZTEST enables requirements-based, baseline, equivalence, and back-to-back testing, including software-in-the-loop (SIL) and processor-in-the-loop (PIL) for external C-Code. By selecting the EZTEST Debug Mode, you can start the simulation for selected test cases in a step-by-step debugger. The EZTEST Buttons enable debugging control. The Information Bar displays the current time step. EZTEST generates an ISO 26262-8 compliant verification report in HTML format. The report is self-contained, i.e. it consists of one single file to simplify version control. The report provides a summary of verification activities, the the information about the testing environment, test harness, test object and the results of dynamic tests in line with the test specification. EZTEST provides complete user documentation and a safety manual which was designed for unit testing at model level in the Simulink environment. 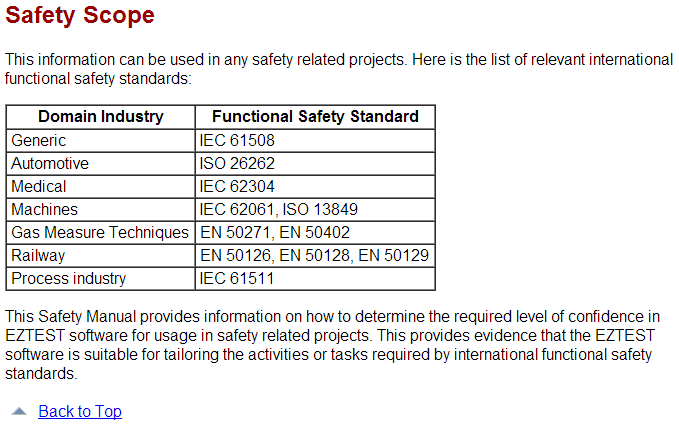 The safety manual provides information needed by function developers to assist them in the unit verification of safety related applications at model level. Following the procedures described in the safety manual ensures correct usage of the EZTEST software in order to comply with the safety standards. Pease note that the same installation workflow is applicable to the EZCHECK® software.